Super Heroes Go To School Part 2- What’s in the Back Pack! 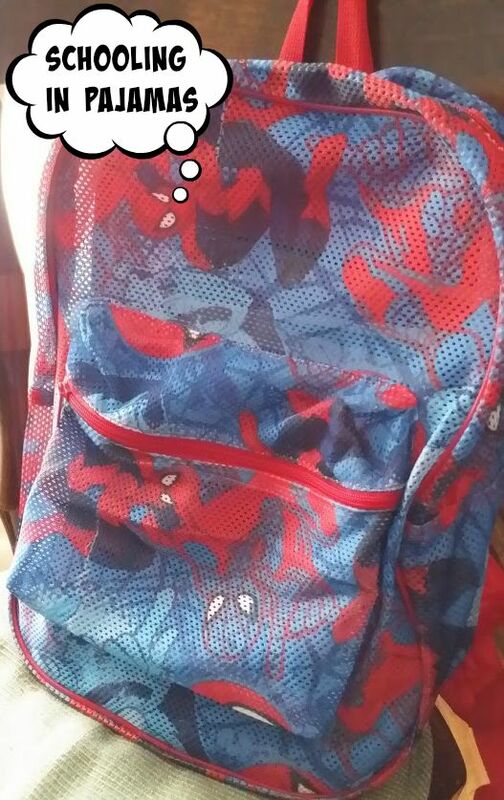 So what does a super hero’s back pack look anyway and what does he carry in it? We thought that D was going to go to public school this year for third grade after I applied for a parapro job at the local school but thankfully (okay all you home school parents you know what I was feeling here) he was able to stay home another year. I found this bag on sale at one of the shoe stores here for $20 which is way more than the $8 I usually spend on the see through mesh bags they require here at our schools. However, I was pleased to see it had a padded back as well as thick padded straps unlike the other bags I’ve previously bought for my older student who went to public school. So money well spent anyway. These are the supplies he keeps inside of his backpack. He has two folders that have two pockets each and are hole punched. They are not pronged folders. I found them at Big Lots for $1 each. In the picture we have two folders but I ended up going back for two more to hold the work we accomplish during the week until I file it into his three- ring notebook. One folder is labeled paper. It holds on one side the special lined paper we used and the other side holds the picture paper that has the same lined paper on the bottom half. No chasing paper down! The other folder is labeled homework. I’ll take a moment to talk about the homework folder. Since we do not have homework in the traditional sense of the word, he really does not know what homework is. It is not really necessary for the type of schooling we do nor do I believe it is necessary. However, having said that let me explain why he has a folder labeled homework. Last year we had a problem with him getting stuff done like handwriting whether it was for writing practice, copy work, part of lesson like science, or just in general. Not just handwriting but some reading and other things. He just wanted to do what he wanted or liked and that was it. Lots of fighting and fussing later it was either not done or done poorly. So this year, I decided to implement a homework folder. If it was not gonna be done or done properly during school time, it would be placed in his folder or bag if it was a reading thing and then worked on after school time during his personal time before he could do anything else. Before my husband’s schedule change, this would have meant waiting til he got home at 4:00 and doing it with him just as if he would have to do if having gone to public school. That would be a good 2-3 hours where he could either do the work with me or read quietly or play outside. No tv, electronics or other fun stuff. Now hubby’s schedule has changed so his homework would get done at lunch time before hubby left for work at 2 pm. If not then we would effectively be grounded from all electronic items and have an early bed with homework the first item on the school agenda. Next in his backpack are 4-5 spiral one subject wide ruled notebooks. These are labeled sign-in, mourning brain workout, writing journal, and the others two are not labeled yet. 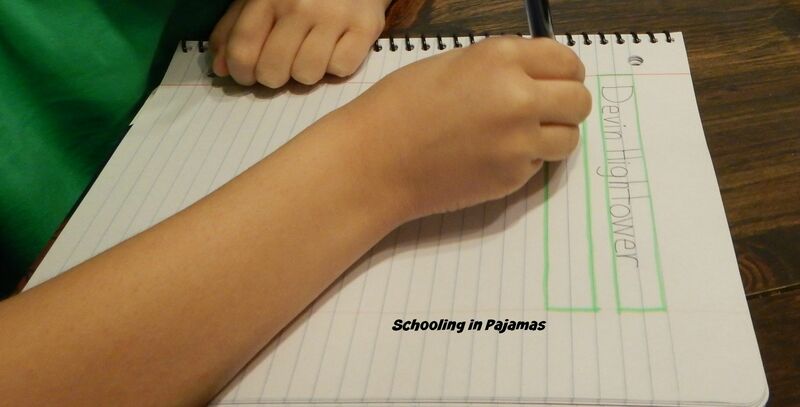 The sign-in notebook was an idea I got off of Pinterest after reading how a preschool teacher used a morning sign-in book each day to help her students practice their names. 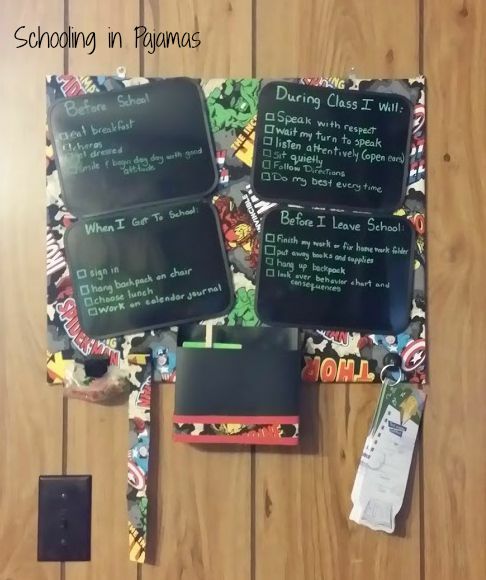 I thought this would be a great way to help Devin practice his first and last name as well as transition him to the size line I want him to write in by the end of the year as well as transition to cursive that we will be using by the end of the year instead of endless practice pages. It also makes a really great way to see his improvement over time or to spot check what needs some individual tune-up practice. I started by highlighting the number of lines I wanted him to write in and then giving him an example to look at. I know that at third grade he should be already doing this by example but since we have not done anything similar to this before, I felt it was good to give an example on the page and it also lets him self correct as needed. No mom standing over him. At the beginning of “class” he gets the book out along with his pencil and begins to write without me having to tell him or hover over him. We then look at it together and he tells me what might need correcting next time. At most it takes 2 minutes to do this. Here he is not satisfied and is erasing what he thinks is wrong. The focus here is to get his name on the paper as close to the example as possible but not to worry about erasing a lot. Each day is a chance to write it better and improve. We are still working on correct pencil holding but I remember it took his older brothers well into middle school to solve their issues. The next notebook he takes out during his morning routine is the mourning brain workout. This is our version of a calendar journal. Each page is different depending on what we need to review or what I want to focus on. 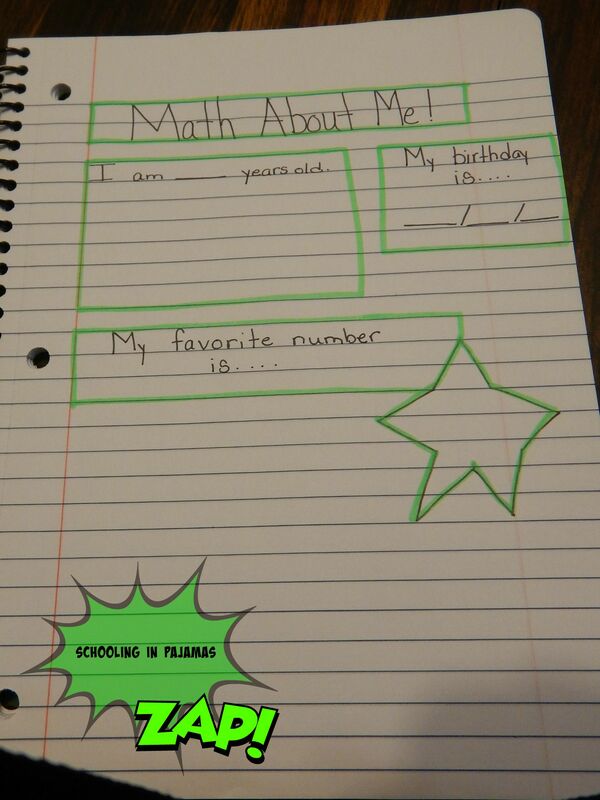 The first day we did an about me page for math. I try not to do these too far in advance so I can tailor them to what we are learning or need to review. Sometimes I want to focus on stuff we touched on in other subjects or holidays coming up, etc. It is practice and it also gives him more writing practice which he desperately needs. He loved doing this page and after he filled in his number I wrote down why it was his favorite number. I will write more on the writing journal when we get to it. I will be using it in conjunction with another idea from Pinterest and along with our Rod and Staff English 3 book when it comes in. There is also a pencil pouch with chunky lead pencils that are triangular with larger lead. They are not mini in size but as tall as a full size pencil. I found them last year in regular colors and this year found them in an Avengers set. 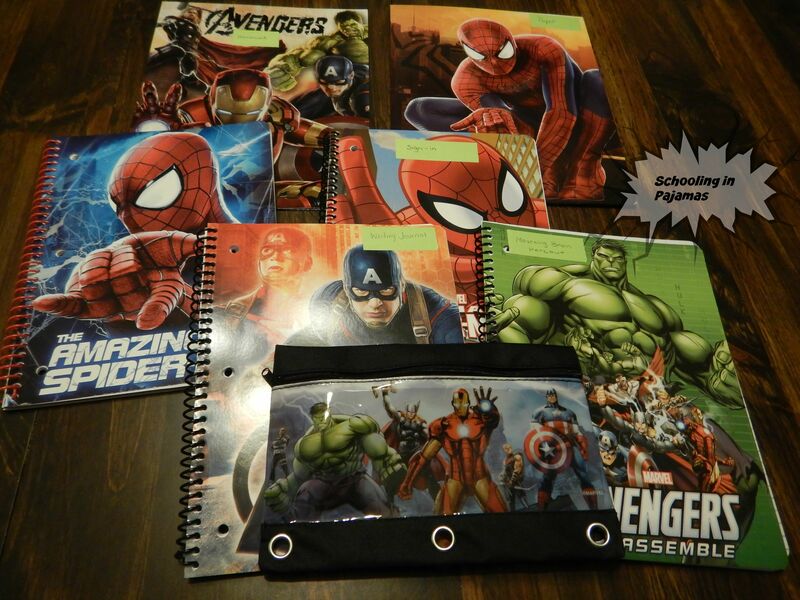 So of course the pencil pouch had to be Avengers too. He also carries a regular pencil pouch with colored pencils that are also thick and triangular in size but are regular height. They seem to help him hold onto them better. Coming up next: The School Room of A Super Hero Learner!